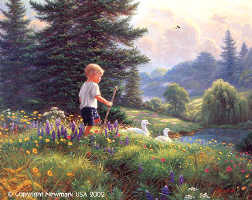 Mark Keathley's Limited Edition Print " Grand Adventure "
Click on image to view a larger image and your browser back button to return. Published by Newmark Publishing U.S.A. The spirit of adventure runs deep in the heart of a child. The desire to set out and explore in the boundaries of their universe is a natural as duck's desire to go to water. These adventures develop a love for learning. The child becomes a student of nature, noticing the way life works. There is time to "consider" all the lessons that can be learned from Mr. Ant , Wooley The Worm, and Madam Butterfly. 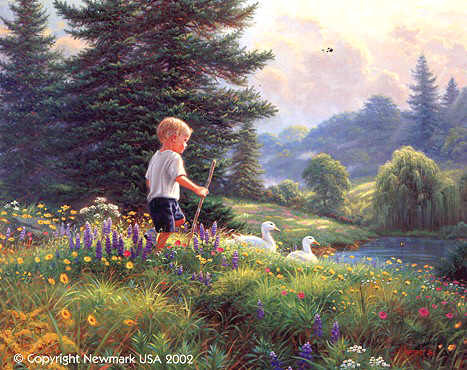 Remembering his early days in the country, Mark Keathley would often say, "Who could sit around and be bored when there is so much to see out there" on a Grand Adventure.